Did you just say wearable pet urns? You heard, or should I say read, correctly. I recently wrote about pet urns, and I know what a tough topic it is to think about. 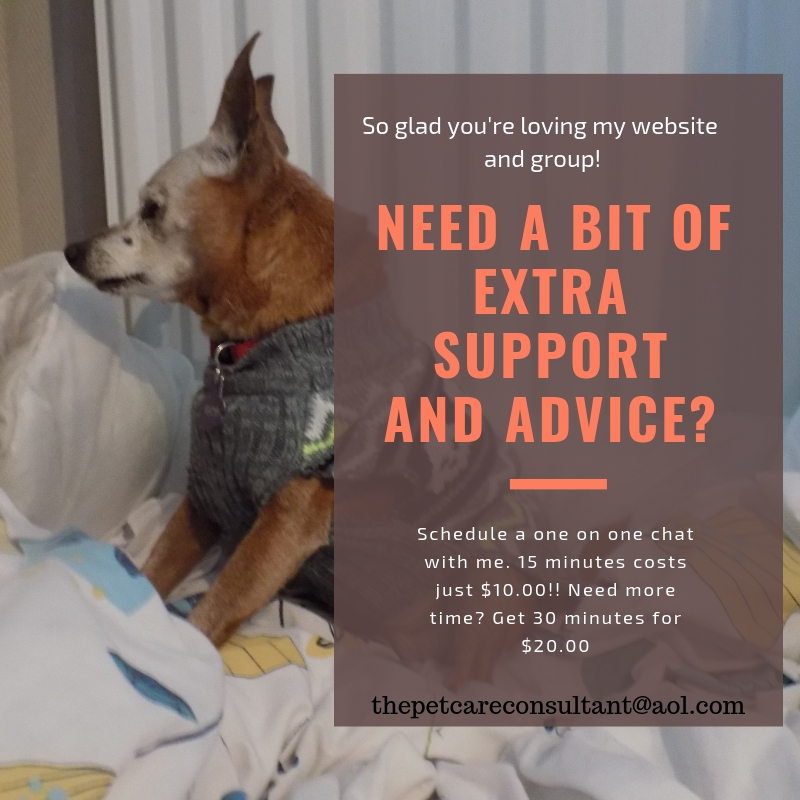 For those of us who like to keep our pets with us, we don’t have much choice I’m afraid. 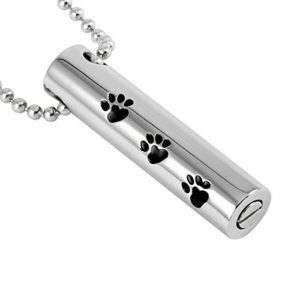 I wanted to highlight another way to keep your pet close and that’s with wearable pet urns – necklaces with space for a small amount of your pets’ ashes. Have you heard of this before? Not sure what to think? It may take a bit of time to wrap your head around this concept, so keep reading and see how you feel. When I got back the cremains of my first cat I received a leaflet, offering me the chance to turn some of her ashes into a diamond. I was so stunned I couldn’t believe what I was reading. Not only did I have no idea it could be done, I was still grief stricken and thought it a bit cold. Anyway, after seeing that, a wearable pet urn didn’t surprise me. In fact, I can understand the appeal. When my cat Calypso died, I was beyond devastated. I couldn’t go to work for three days, I just stayed in bed and cried. The only thing that got me up was a trip we had booked, that I had to go on. When we got to our destination, everywhere I turned I saw the name Calypso, and it’s not a common name or word is it? Because I didn’t know what to do with my grief, I thought I would engrave her name on a heart charm I had found. The mere thought of it was a comfort, and surprisingly (or not!) wearing it made me feel better, and I continued to wear it for quite some time. That’s why I can see how keeping a small amount of ashes with you can bring you comfort, and if it helps then by all means. Blue is one of my favourite colours, no wonder I was instantly attracted. This stunning blue etched rhinestone necklace will not only allow you to keep your pet close to you, it’s a beautiful piece of jewellery. The screw top is secure, so you’ll have peace of mind while wearing it, and it comes with a 20” chain, funnel, pick and velvet bag. This piece measures 1 ¼” tall with screw top bail, 7/8” wide and ¼” deep. I’m a silver jewellery kind of girl, and with the nasty habit of turning jewellery green (something in my blood I guess), the fact that it’s 100% nickel-free stainless steel is perfect. 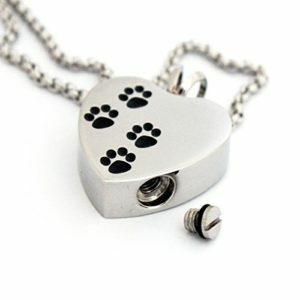 The beautiful heart shaped pendant with paw prints is sweet and dainty. Complete with a 20” rolo chain, funnel, toothpick, full instructions, a velvet bag and condolence card, it makes a wonderful and heartfelt gift. This stunning and elegant urn is made entirely of stainless steel, so it will not fade, tarnish, rust or stain. A rhinestone is a beautiful added touch to this necklace that will match anything in your wardrobe. 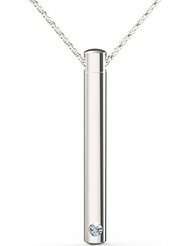 The bar pendant is 1.75″ long, the chain 18″ and the CZ diameter is 3mm. It arrives gift wrapped in a beautiful navy velvet box. 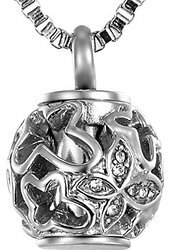 This gorgeous 20” stainless steel memorial urn necklace really speaks for itself. Paw prints and a heartfelt sentiment complete the look. This stainless steel pendant and chain (available in 6 different styles by the way), is perfect for keeping a loved one close. The secure screw on top means the contents are safe, and should you choose to permanently close it, a drop of glue is all you need. 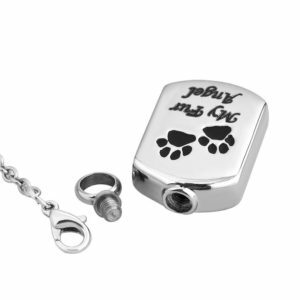 Leave as is, or engrave the name or initials of your pet for an even more personal keepsake. 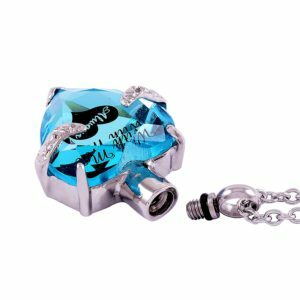 This stunning Aquamarine urn pendant and chain, are 100% nickel-free stainless steel. Included are a 20” rolo chain, funnel, toothpick, instructions, velvet bag and condolence card. It’s engravable which is a nice added touch. 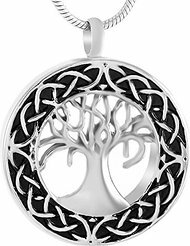 A beautiful piece of memorial jewellery, combined with the symbolism of the tree of life. The versatility of the design means it will look great with any ensemble, you never have to take it off! Made of stainless steel, it comes with a 20” snake chain and funnel fill kit. Just unscrew the top, fill it, and screw it back on and your ashes are safe. Seal permanently with a drop of glue. You may have been a bit stunned when you first landed here, but now that you’ve reached this point, what do you think? After the loss of a pet, we each find our own way of coping. If wearable pet urns sounds like something that will give you comfort, then isn’t it worth a try?